This product is a two full-color, 18 inch by 8 inch, floor plans of a Spaceship, with Hex, Square and No overlay. The PDF includes includes the VTT (Virtual Table Top Images for online play), and a 360 degree view from the center of the map. The product is also available in print on demand (POD) poster map format with no grid as two 12 x 18 posters of the upper and lower decks (Placed side by side this only occupies 24 x18 table space, easily fitting even in the center of even small gaming tables). 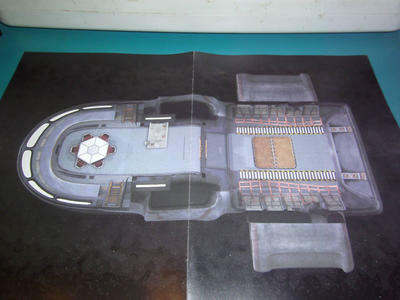 In the PDF map, the ship is gray whereas in the POD poster map the ship color shifts to a more blue gray. The PDF is Free if you purchase the Poster Map version if you click the Poster and PDF option. The Valkyrie Smuggling Ship was trying to sneak past your view, but your ocular sensors have detected DramaScape’s latest space ship map! Valkyrie Smuggling Ship includes the upper and lower interior decks of a small, light freighter. The product includes four 360-degree panoramic views of the bridge, living quarters, mess hall, and cargo areas. The recommendation for use of the poster map is to place the poster maps onto the table, and then overlay a clear piece of Plexiglas on top of them. This will flatten the poster maps completely and the Plexiglas can be drawn on with markers if the map needs modified with the results of an explosion for example. 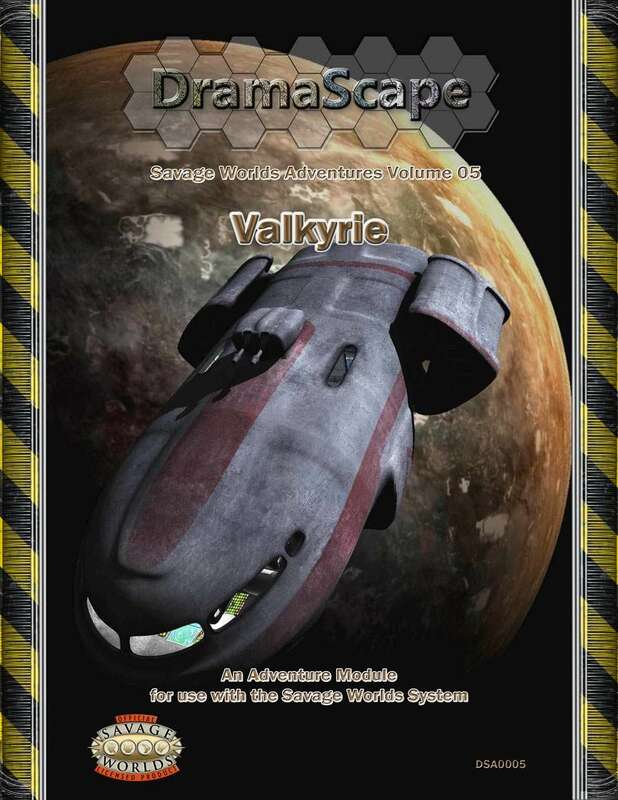 Valkyrie Smuggling Ship includes ship stats for the Valkyrie and its four person crew using the Savage Worlds Deluxe, Science Fiction Companion, and Super Powers Companion Rules (One instance: A Deader’s super power). The product also includes ship stats for our Vanguard Shuttle and the four person crew of bounty hunters and mercenaries trying to track them down. Valkyrie Smuggling Ship is intended for use in near or far-future science fiction settings. Even if not using Savage Worlds, the PDF and poster maps, and the ship and NPC descriptions can be modified and applied to any science fiction setting. Hunting the Spirit Ship: When Hilda Brand stole the Valkyrie Freighter from her previous employers, she thought she was just stealing their new stealth ship and signaling her early retirement from the company. She figured all she needed to do was get out the sector and they would not pursue beyond their megacorporation system boundaries. But the Gestalf Megacorporation relentless searched its sector of space for the Valkyrie. When they found nothing, they put up a bounty of 6000 credits for her dead or alive and 6000 credits for the capture of the Valkyrie intact. Now bounty hunters and mercenaries pursue her even in fringe systems. Will the Player Characters join Hilda’s smuggling crew or will they play the bounty hunters and mercenaries trying to track her down? Continued inside. I don't understand. The blurp describes each map as representing separate decks. Yet the picture of the two maps placed side-by-side seems to show one continuous deck. I can see where the cargo hold might be two decks high. But the break between the maps doesn't fall on the bulkhead between the main compartments and there is no indication of a bridge or quarters (which I presume are supposed to be on the apparently-missing upper deck). Did you buy the poster map or the PDF? I didn't buy either one. I was commenting based upon the pic of the laid-out maps on this (the DriveThruRPG) page. if you look carefully you will see two ladders on the lower deck that lead up to hatches on the upper deck, upper deck is on the left and lower deck is on the right. I really want to like this product, but I still see only a single (possibly split-level) deck. Large common room in the bow, with a roughly-equal sized cargo hold - with possible engine components to either side - in the stern. Is there a second deck on the flip side of each map? Yes the other side of the map is the second deck, its split into the upper and lower decks, upper on one side, lower on the other side.